Taking in the Northernmost region of the Australian mainland, a Cape York cruise takes guests on a journey around one of the most remote and exciting parts of the country. Cruises around Australia’s north coast take you to tiny villages, aboriginal islands and bright and colourful coral reefs. This region is home to a strong community of aborigines who make up around sixty per cent of the population. Many cruises to Arnhem Land offer the chance to learn more about these aboriginal communities and their traditions and history. One of the things that makes Cape York and Arnhem Land special is the expanses of untouched tropical rainforest. These forests support significant populations of birds and eleven endemic species of butterflies as well as being home to crocodile habitats in the mangroves and wetlands. On the coast the wildlife is just as plentiful, coral reefs support huge numbers of fish including giant potato cod. Turtles and even manta rays can also be spotted by snorkelers and divers especially near Lizard island. Lizard Island is one of the main attractions in Cape York and Arnhem Land. This sunny, palm lined island is home to beautiful beaches and a large fringing coral reef. This is a great area to see turtles and fish as well as take part in some hiking in the forest in the middle of the island. There is plenty to see in the forest as well, with the monitor lizards the island is named after all over the trees and flying foxes hanging under branches during the day. In Australia cruises often visit Lizard island to give guests the chance to explore one of the best areas of the Great Barrier Reef by snorkelling or even scuba diving. Whether you have bushwalking, cultural visits or are looking to indulge in the local history Cobourg Peninsula ticks all the boxes. The undeveloped wilderness is home to only around forty people but plenty of wildlife and some great spots for fishing for salmon. The sea here is particularly rich with marine life including turtles and dolphins as well as the huge shoals of fish that attract them. Those who want to learn more about the history of the region should stop in at the ruins at Port Victoria which were left abandoned after one of many failed attempts to colonise Coburg. Tradition and history are also the highlight when a Port York cruise stops at Thursday Island to visit the Torres Strait Islanders. This group is different from the aboriginal groups of Australia and are ethnically close to Melanesian people and have a distinct culture from their neighbours as well. This area was also an important place in the pearling industry and still produces pearls, albeit in smaller numbers than previously. Visitors on a Cape York small ship cruise will often be treated to details of the history and cultural displays from the islanders while visiting. The best Cape York cruises for history enthusiasts stop off at Cooktown on the eastern coast of the peninsula. This town was named after Captain James Cook who came in 1770 and established the first European settlement here. Prior to this, the region was inhabited by aboriginal groups and there is a rich history of aboriginal culture in Cooktown. Visitors can enjoy tours of the aboriginal rock art that is found in the caves nearby the town and also find aboriginal artists selling their work in various art shops. A Cape York cruise lets visitors take in several unique islands close to the peninsula in addition to the more well known spots. Many of these are inhabited by aboriginal groups who are happy to show their fascinating traditions and art to guests. Elcho Island is particularly special due to the prohibition of all vehicles and the strict regulation of outside influences. The people here specialise in the making of aboriginal artwork and it is possible to see both ancient and modern art. If you have the chance to visit Elcho then you are one of the lucky few, access to the island is restricted by law and cruises must have permission to land here. Hiking or bushwalking is the best way to see as much of the unique wildlife that can be found in the Cape York and Arnhem land peninsula, so make sure you bring good walking shoes. Beachcombing and walking around wetlands is also possible, so make sure your shoes are very waterproof as well. The wildlife in this region varies from kangaroos to rare butterflies so be sure to bring a camera and for serious photographers make sure you have the right lenses for the different subjects because they are plenty and varied. The wildlife in Cape York is normally very safe to interact with, the one exception being saltwater crocodiles which are fairly common. It is possible to observe them but make sure you keep a sensible distance, binoculars could be useful! Be sure to avoid swimming where there are warning signs for crocodiles and do not assume just because there is no sign that there are no crocodiles. Most Cape York boat cruises visit the peninsula during the dry season between May and December, outside of these times the region experiences some very heavy rainfall and monsoons. The most popular periods for visitors in general are June, July and August when the area is quite busy, if you want to visit at this time be sure to plan ahead as Cape York and Arnhem land holidays in Australia book up quickly. 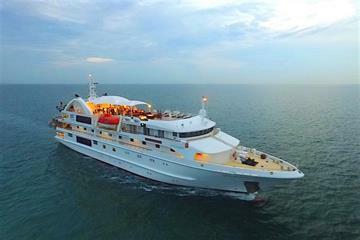 The best time to take a Cape York and Arnhem land cruise is the quieter months March, April and December when the temperatures are still good but the peninsula is not quite as busy. If you take a Cape York and Arnhem land cruise in March and April, you can enjoy the burst of lush greenery that comes after the end of the wet season as well. Thanks to the plentiful vegetation this is also one of the best times to see wildlife in the forests of Cape York. Where do Cape York & Arnhem Land cruises depart from? Australia small ship cruises that visit Cape York and Arnhem land leave from either Darwin or Cairns often departing from one and finishing in the other. This is great as it avoids unnecessary extra sailing time to return to the port of departure, meaning more time to spend adventuring. The dock at Darwin can be reached from the airport by shuttle bus to the town. The quay is around a kilometer from the town and so easily accessible from there. In Cairns there is also a shuttle bus from the airport and the harbour is around 15 minutes from Cairns airport. Cairns and Darwin both have international airports with flights from Singapore, Kuala Lumpur and Hong Kong as well as domestic flights from Sydney, Melbourne and Brisbane. The best option for those traveling from Europe and the U.S.A is to take a connecting flight through Asia. 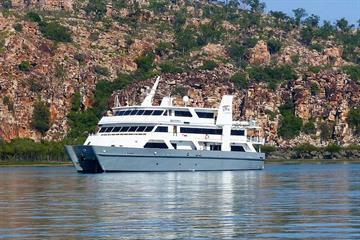 Please contact our reservations team to book your next adventure cruise to Cape York & Arnhem Land, Australia.